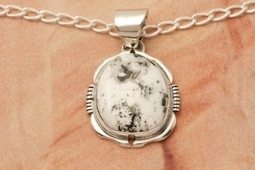 Genuine White Buffalo Turquoise set in Sterling Silver Pendant. This Beautiful Stone is formed from the minerals Calcite and Iron. It is mined near Tonopah Nevada. Free 18" Sterling Silver Chain with Purchase of Pendant. 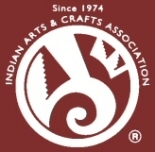 Created by Navajo Artist Evelyn Bahe. Signed by the artist.